Fun and safe in the sun! For those old enough, you can remember the metal slides that burnt every uncovered part of your skin when playing. Nowadays, these constructions are bit more safe but in regards to playing and having fun in the Summer, need to remember some basic safety tips. The sun. Much of skin diseases can begin prior to the age of 18 so be liberal with sunscreen for your kids and you too. Make sure to apply every two hours and be sure to get those places where the sun hits the hardest – the nose, back of the neck and even the top of the ears. If you’re sunbathing or swimming then all of the uncovered parts and don’t forget the top of the feet. For some reason, that is one spot many people forget. Wear a hat and sunglasses. And, if hanging out at the pool all day, spend some time in the shade. And if swimming in the pool, keep the “arm away” rule with little kids. That means you’re never an arm away from them swimming so you can rescue them if anything happens. And, remember, anyone can drown so keep an eye on everyone to be the safest. And, water! No matter what you do, especially in the Summer, make sure you drink plenty of water. And make sure the kiddos drink plenty of water. Always ask them and don’t wait until they say they’re thirsty. That usually means they’re already dehydrated. What about mowing the yard? If you have a riding lawn mower, the general rule of thumb is that no one under 18 is supposed to use one and no one under the age of 12 should use a push mower. For gas powered mowers, don’t touch the engine. Make sure it is off when refilling and always make sure the blades have quit rotating and are completely off when cleaning grass out. Try not to back pedal when mowing. It’s the easiest way to trip, fall and get hurt. Always wear sturdy shoes and clean up the lawn of big sticks and debris so you’re not shooting off large dangerous chunks to you and others. Now, back to the playground. Just because they’re not metal, test the slides and seats before the kids play. Plastic can still get dangerously hot. Remove anything that has straps to get caught on the equipment even helmets. Never allow children to attach ropes, leashes or anything that can strangle. Inspect playground equipment for long bolt ends that can make a nasty gash or an S-hook to get caught. Throw a great outdoor party this Summer. Memorial Day’s just around the corner so time to celebrate. And celebrate outside with friends and family. 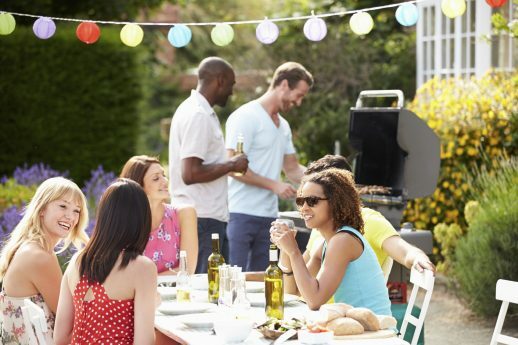 So here’s some outdoor party tips to help make the ultimate party. Get a good handle on the number of people. There are all sorts of apps and web software to create invitations and manage the preparation for the party. These programs can tell you how and who to expect. You can customize the invites. Send out updates. Sign up lists if you need help or if it’s a potluck. Theme. Memorial day is about remembering the fallen of our great American soldiers. Have some flags hanging or those commemorative small ones on the tables. If you have relatives who need to be commemorated, have photos of them properly displayed. And you can also push the red, white and blue theme in the decor. Food. Make sure you have plenty is the obvious tip. You can go two ways on this one. Use the cooking of the food as the centerpiece. For the most part, that means outdoor grilling. Have people bring their own grilling delicacies and cook it for them or swap off. The smell of good outdoor cooking can make for nice ambience. OR, have everything ready prior and spend time just refilling or replacing. Recruit help to monitor empty trays. Drinks. Know your audience is the best advice. This way you know how much and what kind to have. Even add that to the online invite to help. Or, many times, and is fine in an outdoor setting like this is to BYOB – bring your own beverages. Just make sure there are enough space in your refrigerator and coolers throughout the yard. Designate one cooler for the kid’s drinks. Make sure you have enough cups and napkins. Make sure it’s kid friendly if it’s open to families. Have a dedicated room playing movies or video games. Especially those games that make them move like “Just Dance”. Have sprinklers, blowing bubbles, beach balls, squirt guns but make sure there’s something that keeps the kids happy and wanting to be there. Make sure there’s enough seating. While many people will be standing and mingling, you want to make sure there are enough seats to sit and tables or stands to place drinks. Music! Set up a minimum of a 2 hour playlist of the best and classics. From One Direction to Chuck Berry and everything in between. Make sure to mix it up. Don’t play one artist, genre or in the same decade more than 2 songs in a row. Unless it’s a themed party of course. You don’t want that person groaning twice who happens to not like that song or genre. You want to tell guest that ‘don’t worry’ if you don’t like this song, you’ll like the next as they range all over decades and genres. Make sure they’re upbeat and make sure they’re popular. Parties are not the time to play esoteric music. You want people to smile and have fun and using songs to touch off good conversation. Set the speakers high so they’re not blaring in people’s ears. Try to get four spread out. The high quality of wireless and small speakers are incredible and affordable these days so having good background music is not the monumental feat it once was. Prepare for the clean-up now. If you’re worried about stains then make sure you have plenty of paper napkins available. Make sure there are trash cans readily available but somewhat hidden so there are no eyesores. Designate your recyclable cans. And monitor them regularly to bag up when full and replace. You don’t want overflowing garbage. A good tip for readily available trash bags is to put a stack on the bottom of the trash can so when you lift the full one, empty ones are ready right there. Make sure there’s enough light. If your party goes into the night time then you need to have proper lighting. String lights give off a good glow. Not too bright but enough to see well and for ambience. Use those string Christmas lights in your basement if they’re not too obviously Christmasy. String lights are also cheap. Another suggestion are those solar lamps and lights. They have a unique feel and look but can be a bit costly on the front end but they don’t cost any electricity from then on. Make sure extension cords are secure. Use all of those extra wire hangers and cut them into U shape pieces to firmly plant the cord into the grass. For pavement, use heavy duty duck tape. You do not want guests kicking around or stumbling on the loose cord especially after a couple of drinks. Duck tape is now being offered in many different colors so you can still be festive as well as safe. Create a slide show. Putting together a pictorial slide show on your computer and/or to your TV is fairly easy and can be loads of fun for the guests especially if they’re in them. Use one of the many slide show programs out there which many are free. Keep mosquitos away and stay cool at the same time. Set up some fans. Get rid of standing water. Get some cintronella candles and have some spray or wipes readily available. Rent it if you don’t have it. 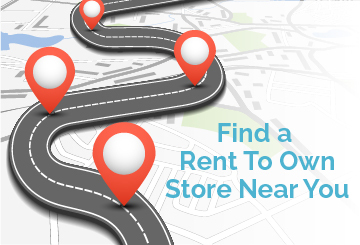 Go to your local rent-to-own store if you’re looking for furniture, sound systems, refrigerators or computers for that week or if you want to replace some of your old ones. Find your local party rental place for the specialty party items you’ll need. But, shop around! Many party rental places are expensive. Use the summer weather to paint the house. Each season brings in a new set of chores specifically designed for those months. With summer, those months represent dryer conditions, warmer temperatures and longer days. That means it’s perfect for the outdoor duties. So here’s some of the most popular things to put on your summer to-do list. Paint the outside of your home. Maybe it’s just touching up areas or painting the whole thing. But, temperatures are usually warm enough to be agreeable for outdoor paint. Experts say that ambient temperatures should be above 50 degrees. With today’s paint technology, some will allow down to 40 but make sure. Make sure the wood is dry. If it rained, wait at least a day before painting. Fix rotten wood. Summer are usually dryer and warmer providing perfect conditions to fix that rotting wood. Much of the time you can do it yourself by using epoxy wood filler. Grind out all of the rotten wood then apply the filler then sculpt, scrape and sand to fit the mold. The epoxy wood filler is good for smaller areas. Larger ones need replacement or more professional help. Clean the gutters. It’s warm, sunny and dryer conditions so gives you those conditions to clean them out from those spring rains. Much wood rots because of clogged up gutters so always remember that ugly chore. Trim the trees and get that yard in shape. Now that all of the leaves are on, you’ll be able to see perfectly which branches are dead or dying. You will also be able to see which branches are or going to be hurting your roof, fence or parts of the house. Get rid of them so the tree looks good, your house doesn’t get damaged and water is not wasted on branches that ultimately will fall off in the near future. Clean out sheds or the garage. Check out our get rid of the clutter for some extra tips. It might take several days to bring everything outside to thoroughly clean out these storage spaces. Summer days can make that happen by giving you better weather or that longer day to make that painful chore happen. Another ShopRTO home lifestyle tip. ShopRTO provides consumers home living, decorating, DIY tips and when rent to own can make your daily life better. Brighten your day with your yard. It’s that time of the year which means flowers! Lots of them, too. Whether planting them for your home garden or putting them on vases or on the front door. There is nothing better for the home, family and soul like flowers when driving up to your home. Here’s some basic tips to get you started in the right direction. When planting flowers in your yard, there’s several different factors you have to keep in mind. First thing you should look at is the USDA plant hardiness zones to make sure the money and time spent is worth it. Especially in the south. The southern states can handle most flowers during the spring but die the moment that summer heat comes. Then you need to know their life distinction – perennials, annuals and biennials. Perennials are plants that live beyond three years with flowers blooming each season. Roses are a good example and roses can be hardy throughout the country. But, the higher north you go, roses can get much bigger, brighter and fuller. Look at Portland’s rose garden and all throughout the northwest. Azaleas are another good example. In spring they burst with a brilliant purple color for about two weeks then gone until next spring. But they are hardy bushes that create an even, green look especially against the walls of your house throughout the year. Annuals are those plants that live, die then seed in one season. In the south bluebonnets are a good example. Beautiful for those three weeks then die and hope those seeds replant the next season, which they do. Other good annuals are marigolds, trumpets and daisies. The trick with annuals is the sun/shade factor. Most annuals need a good amount of shade. And if those plants are going to last a short time, money is going to be a factor especially when on a budget which this blog is for. So, the BEST ADVICE for cheap annuals is buy the seeds and plant each year. Planting seeds can make plant designs and little more difficult but is best for the budget. Biennials are those plants that have a life cycle of two years so some planning is needed for their first and second year blooming. Pansies are the most common type of a biennial flower. Hope those help. We wanted to give you the tools to best pick your strategy so quit reading and go get dirty for a pretty yard. Just another ShopRTO Outdoor Decorating tip.